Many people have heard of the ordeal that Lara Logan went through during the Egyptian riots. Now, Lara speaks out and tells what happened. We hope that Lara's recovery continues, and thank her for her voice and bravery. Her decision to speak out may help protect others against having to endure such horrible experiences. Sexual assault is a very real, and very prevalent, problem. Nobody should ever have to experience it. Hat-tip to Christina Rad's blog entry about this. Tonight, the White House made the surprise announcement that Osama Bin Laden is dead as a result of small precision strike against his compound in Pakistan, following a brief fire-fight. Eight years to the day, on the anniversary of former President George W. Bush's infamous "Mission Accomplished" carrier speech, the mission has - finally - been accomplished. The action was a surgical raid by small team and sought to minimize civilian damage. In addition to Osama bin Laden, three adult men were killed, including one believed to be bin Laden's son. One woman being used as a shield in the compound was also killed. Two women were injured. The team was in the compound for 40 minutes. Lost a helicopter due to mechnical failure. It was destroyed. [Update]: Osama bin Laden's body will be handled in accordance with Islamic tradition. Get the full text of the President's remarks over the fold. 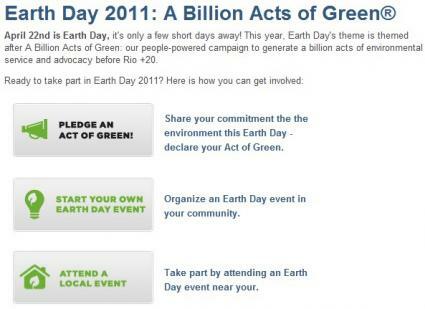 Screenshot of the Earth Day Network site page for "Earth Day 2011." What will you be doing for Earth Day 2011? If you or someone you know is able to host, please sign up now. In 2010, The Fresh Air Fund's Volunteer Host Family program, called Friendly Town, gave close to 5,000 New York City boys and girls, ages six to 18, free summer experiences in the country and the suburbs. Volunteer host families shared their friendship and homes up to two weeks or more in 13 Northeastern states from Virginia to Maine and Canada. To learn more about becoming a host family, read more here. If you are located in one of the five boroughs of New York City and wish to sign your child up for the program, read more here about how to sign up. 1 Information according to the Fresh Air Fund fact sheet. Breaking news from Utah -- FBI and Hazmat teams respond to a Utah IRS office; decontamination showers deployed. According to initial reports, this is in relation to some white powder mailed to the office. (CNN) -- An Army civilian employee missing in Baghdad, Iraq, since January has been identified as a 60-year-old man from California, the U.S. military said. Issa T. Salomi of El Cajon was last seen in the Iraqi capital and has been unaccounted for since January 23, the Department of Defense said Friday. Salomi was working with U.S. Forces-Iraq in the country. Search efforts are under way, the military said. No more information was available. Both Kirk von Ackermann and Ryan Manelick worked for Ultra Services of Istanbul, Turkey. Edward M. Kennedy, the "Liberal Lion" of the Senate, died at his home in Hyannis Port last night. Kennedy family statement via Boston.com. Folks who were waiting and watching the festivities got more than a simple "Site Offline" message -- we periodically updated at random intervals throughout the process. And, while the Community site is back, we still have to complete the move of the Journal, Timelines and our Investigates sites. But, never fear. We're back, and below the fold you can see the updates that we kept posting -- and which some people still see, as the DNS propagation slowly makes it was across "teh intertubes" and some people are unfortunately still seeing the cached old server with the Offline msg. We have enormous respect for the Huffington Post and particularly for Arianna Huffington's brilliant analysis. But when a progressive Internet site -- and the leader on the web -- takes a turn toward the sensational and panic peddling, it's time to pause for reflection upon the impact of commercial investment on the web. Huff Post started out as a sort of a celebrity blog version of the Daily Kos -- and with the oversight of a former AOL honcho and the infusion of millions of dollars in capital, it expanded into a progressive online newspaper. It had the money, the celebrity panache, and the brainpower to create the news source of the future, and people -- particularly liberals -- flocked to Huff Po. Two-thirds (67%) of U.S. residents "strongly" or "somewhat" favor establishing a public health insurance option "similar to Medicare," with about 80% of Democrats, 60% of independents and 49% of Republicans in favor of such a plan.